Jack Borden in his office, where he has no plans to retire. Jack Borden was born on a Texas farm that's now at the bottom of a man-made lake. He grew up in a log cabin without electricity and started working corn and cotton fields when he was five. At age 11, he was leading a horse-drawn grain binder to cut wheat. 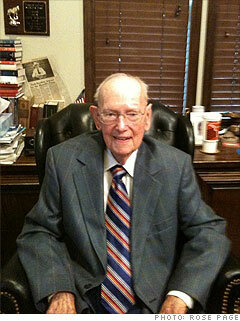 Borden has been a lawyer since 1936 and continues to work full-time at his firm. He was also a mayor, a district attorney and an FBI agent. He continues to chew tobacco, a lifelong vice. "I've got a mouthful now," he noted during a recent interview. He keeps an antique spittoon by his desk and has more of them piled in the corner of his office. Borden says he "never worried about dying" and has no plans to call it quits. "When the gals come into the office and I've got my head down on the desk, and I ain't moving, then that's when I'll retire," he says.